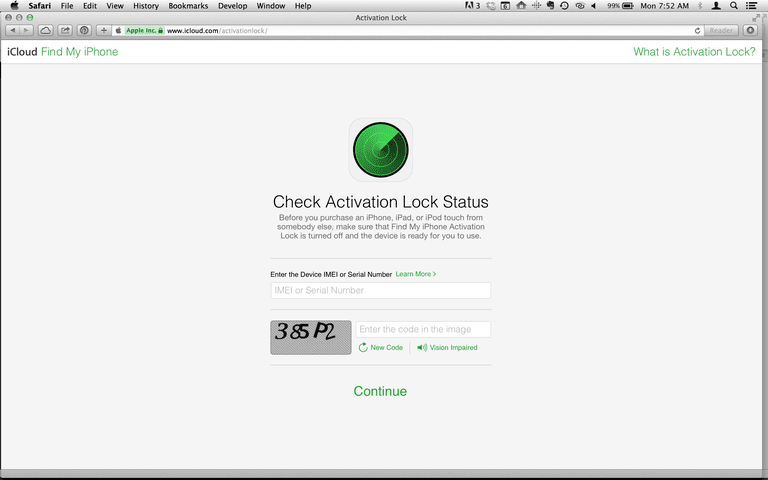 Checking an iPhone's Activation Lock status can tell you whether it's been stolen. UPDATE: For reasons that have not been publicly explained, Apple has removed the Activation Lock status tool described in this article. There is now no way to check Activation Lock status online. You can still check this status directly on a device, though. To learn how to do that, read What To Do When You Can't Activate a Used iPhone. No more guessing whether the used iPhone you're buying is stolen — Apple has released a tool that tells you what you need to know before you buy. Almost since its debut, the iPhone has been an extremely popular target for thieves. After all, a pocket-sized device that millions of people want to spend hundreds of dollars on is a pretty good thing to steal and sell, if you're that kind of person. Apple attempted to address this issue with the Find My iPhone service in 2010, but that could be defeated by turning the iPhone off or erasing the contents of the phone. Apple made things much harder on thieves when it introduced Activation Lock in iOS 7. This feature made it impossible to activate an iPhone using a new Apple ID without entering the Apple ID and password used to activate the phone originally. Since it's unlikely that a thief would have access to a person's Apple ID and password, this helped cut iPhone theft substantially. While this feature helped deter some thieves, it didn't help people buying used iPhones. There was no way to check a device's Activation Lock status ahead of time. A thief could sell the stolen iPhone over the Internet and the buyer wouldn't discover that they'd purchased a useless device until they'd already been swindled. But now Apple has created a tool to check a phone's Activation Lock status to ensure that you're not buying a stolen device and that the phone you're getting can be activated. Scroll towards the bottom of the screen and you'll find both numbers. Go to Apple's Activation Lock Status website. Type the IMEI or Serial Number into the box. Enter the CAPTCHA code displayed. The next screen will tell you whether the iPhone has its Activation Lock feature enabled. The Phone Is Stolen: An iPhone being sold with Activation Lock still enabled could mean that the device is stolen since a thief probably won't be able to disable Activation Lock. Ask the seller to disable the feature and check again. If they refuse or can't do it, don't buy that phone. The Seller Forgot to Turn Off Activation Lock: It's possible that an honest seller has forgotten to turn off Activation Lock. Ask them to disable the feature. If they do, you're OK to buy. When buying a used iPhone, make sure to ask for the IMEI or Serial Number before you buy and use this tool to check the device's status. It will save you money and frustration. This tool isn't connected to any police systems, so it doesn't cross-reference police reports of stolen devices. This checks Activation Lock status only. Since Activation Lock was introduced in iOS 7, if the device you're buying is running iOS 6 or lower (unlikely these days, but not impossible) the tool can't help you. While pretty unlikely, it's technically possible that a thief could have access to the Apple ID and password associated with the stolen phone they're selling. In that case, the thief can remove Activation Lock and sell a stolen phone without the tool being able to help you.